The word most commonly used in the Old Testament for drinking-vessel is (Gen. xl. 11, 13). first occurs in the story of Joseph for the cup with which he "divined" (Gen. xliv. 2-12, Hebr. ), and from Jer. xxxv. 5 it appears that it was larger than the , corresponding to a goblet or crater. The was also one of the ornaments of the golden candlestick, or menorah (Ex. xxv. 33 et seq., xxxvii. 17-21), and is described as being "almond-shaped" ( ), like the calyx of the almond-flower. Other words, like , which the English versions sometimes render by "cup" or "goblet" (Isa. xxii. 24; Song of Solomon vii. 3; Num. iv. 7; I Chron. xxviii. 17; Jer. lii. 19), were used to designate rather a basin, or bowl-shaped vessel. It may be assumed that the cups of the Jews were in general of the same material, design, and workmanship as those of the Egyptians, Assyrians, and Phenicians, whose craters were celebrated even in Homer's time (Homer, "Iliad," xxiii. 743; idem, "Odyssey," iv. 615-618). 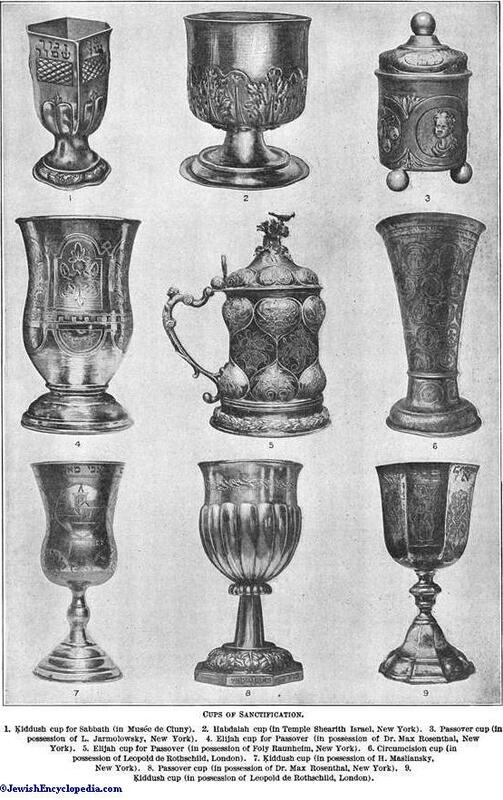 The cups used at present in synagogues for "ḳiddush" and "habdalah" are generally of silver, oblong, and shaped like an inverted dome, with a stem and base, resembling the cup figured on the Maccabean coins. "Cup" is frequently used in metaphors of good or of ill fortune, as in "My cup runneth over" (Ps. xxiii. 5, xvi. 5); "the cup of his fury" (Isa. li. 17, 22); "the bowl of the cup of staggering" (Zech. xii. 2, Hebr. ); "the cup of astonishment and desolation" (Ezek. xxiii. 33). Babylon is a "golden cup in the Lord's hand that made all the earth drunken" (Jer. li. 7). The "cup of consolation" (Jer. xvi. 7) is one offered to mourners; while the "cup of salvation" (Ps. cxvi. 13) is a cup of thanksgiving for deliverance, in allusion, perhaps, to the wine of the peace-offering ("shelamim"), or to the cup of praise and thanksgiving. In the Talmud the figurative use of "cup" for trouble and suffering (Ḥul. 92a; compare Gen. R. lxxxviii. 5) is observed in the expression "to taste the taste of death" ( Yoma 78b; in the N. T., Matt. xvi. 28; Mark ix. 1; John viii. 52; Heb. ii. 9; compare "Etymologicon Magnum": ποτήοιον...σημαίνει καὶ τὸν θάνατον). Another figurative use of "cup" is for one's wife (Ket. 75b; Ned. 20b; Giṭ. 90a). Ten—at one time fourteen—cups were ordained for the house of mourning (Ket. 8b; compare Sanh. 70a). The "cup of benediction"—i.e., the third of the four cups of the Passover meal—is often referred to (Ber. 51a; B. B. 97b, etc. ; in the N. T., I Cor. x. 16). For other interesting references to "cup" see Ket. 65a; Pes. 96b; Yoma 75a; Beẓah 15b, etc. 1. Ḳiddush cup for Sabbath (in Musée de Cluny). 2. Habdalah cup (in Temple Shearith Israel, New York). 3. Passover cup (in possession of L. Jarmolowsky, New York). 4. Elijah cup for Passover (in possession of Dr. Max Rosenthal, New York). 5. 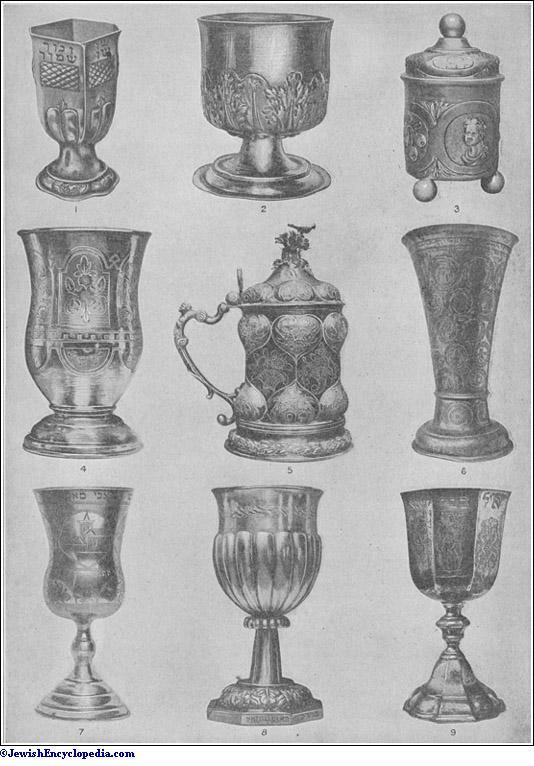 Elijah cup for Passover (in possession of Foly Raunheim, New York). 6. Circumcision cup (in possession of Leopold de Rothschild, London). 7. Ḳiddush cup (in possession of H. Masliansky, New York). 8. Passover cup (in possession of Dr. Max Rosenthal, New York). 9. Ḳiddush cup (in possession of Leopold de Rothschild, London). In Gen. xliv. 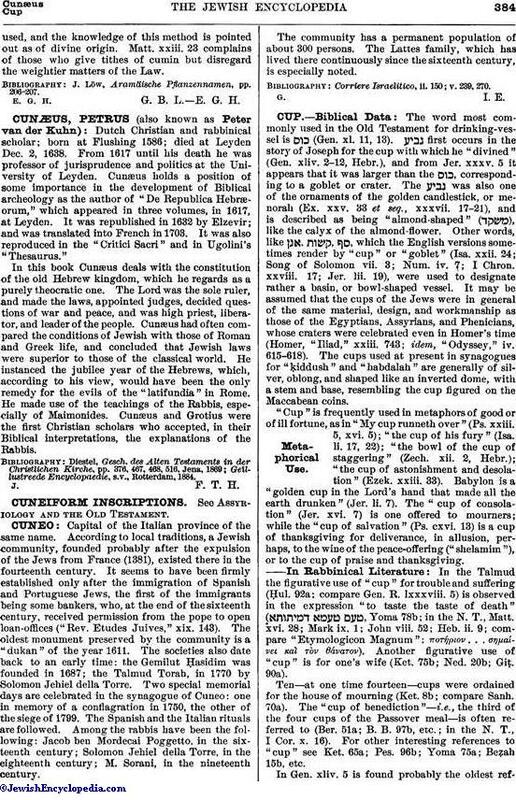 5 is found probably the oldest reference to divination by cup (κυλικομαντεία, also λεκανομαντεία), a species of hydromancy. 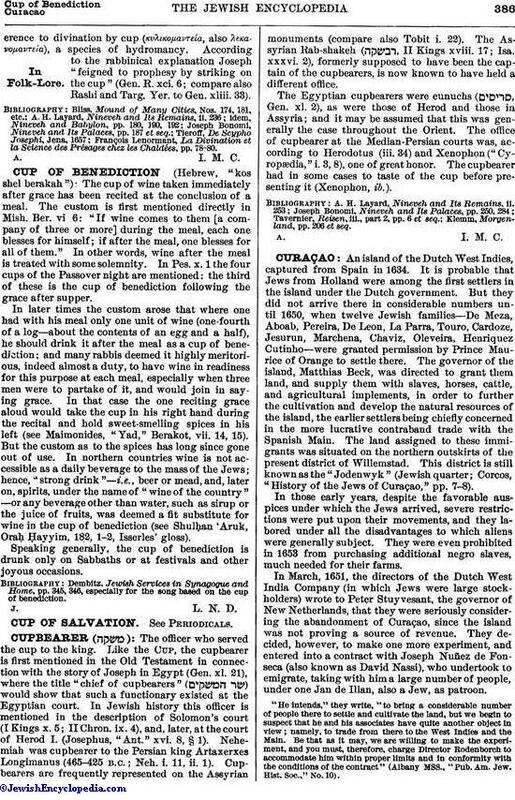 According to the rabbinical explanation Joseph "feigned to prophesy by striking on the cup" (Gen. R. xci. 6; compare also Rashi and Targ. Yer. to Gen. xliii. 33). François Lenormant, La Divination et la Science des Présages chez les Chaldées, pp. 78-80.